My friends (and partners) watched the preview night of The Full Monty last week. Even if I wasn’t a show buyer, I would STILL rave about the show. There has been a lot of talk about the finale and what they say is true. I don’t want to go into details but we LOOOVED the play. 1. You haven’t seen a musical like this in Manila. 2. You will laugh your heart out. The whole audience was laughing throughout the play. This is the first comedic musical I’ve seen and it is worth it. Not only are their lines funny, so is the music! Watch out for the song featuring Mark, Jaime and Oj – an interesting take on what friends will do for each other! 3. The women of The Full Monty. Everyone in the cast was fabulous. 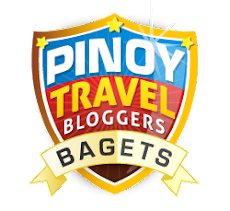 As my cousin would say “walang sapawan!”. Imma Castro and Joy Glorioso hold their own and deliver powerful and memorable performances. 4. It will touch you. We’ve all felt at least one of the emotions conveyed by the play – desperation, frustration, love for your child or feeling inadequate. These are just some of the themes present in the play. My partners and I got teary at different parts of the musical. It’s really just about average men, doing something extraordinary to further their lives - it’s a musical about underdogs. 5. The men, seriously the men. Without a doubt the 6 men deserved to be praised for their performances in the play. Mark Bautista takes on his first English musical as Jerry. Mark is a singer first and actor second but showed his acting chops here. This is the third time I’ve seen Oj Mariano on stage and he is making me a fan. I previously saw him in Sweet Charity and Little Mermaid and his role as Malcolm MacGregor proves his mettle as a versatile actor. Nino Alejandro burst into the theater scene as Ethan Girard and I expect to see him in more plays in the future. It’s too bad that you only get to hear him sing his heart out in the end; I would have wanted to hear more of him. 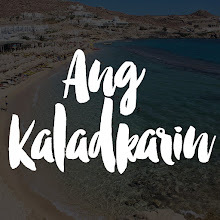 Arnell Ignacio brings a comedic energy to the play like no other. I can’t picture the role going to anyone else. I haven’t seen Marco Sison in the entertainment industry for years and I applaud him for playing old timer Noah “Horse” Simmons. He plays an old black man effortlessly with such believable grace. Theater veteran Jamie Wilson shines as Dave Bukatinsky. His is the comedic heart of the play and delivers with flying colors. In the end, we found ourselves laughing with and cheering for the cast. 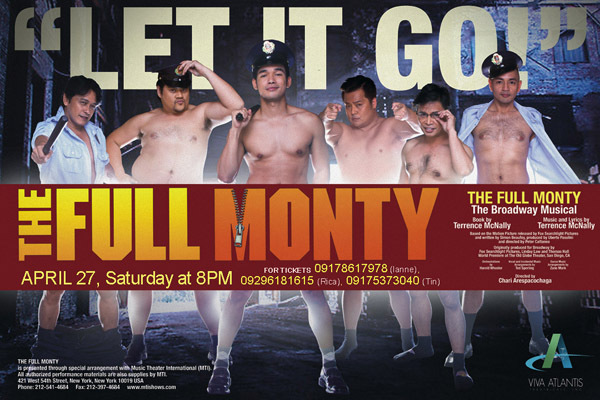 If you find yourself looking for a GREAT laugh, make sure to catch this Saturday’s 8 PM show of The Full Monty. Make sure to warm your vocal cords, the audience is encouraged to clap, howl and make noise during the finale! For ticket reservations, text or call 0917-8617978 (Ianne), 0929-6181615 (Rica) and Tin (0917-5373040) or email us at fullmontyapril27@gmail.com. * Additional photos from Viva Atlantis Theatricals.